DALLAS, TEXAS - A sealed vintage Beatles "Butcher Album" (Rated GEM MINT 10 Condition) soared to $125,000 at Heritage Auctions over the weekend. The sale set a new world record. 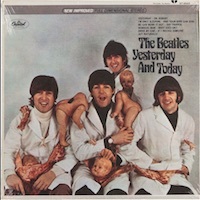 The 1966 album, put out as an early release of "Yesterday and Today" immediately created an uproar due to its image of The Beatles covered in raw-meat and baby-doll parts. The controversy severely limited the number of albums making it to market, because a majority of albums were recalled shortly after the introduction. Reportedly, Sears only had the album on their shelves one-day before pulling it. Many other stores refused to carry it all. Rather than throwing the album covers out. A decision was made to cover-up the original album cover with a less controversial image applied as a sticker over the original cover. These albums are known as "second-state" Butcher covers. The recall, makes original (first-state) versions extremely rare, and copies in excellent sealed condition even rarer. According to Heritage Auction's online view-counter. There were over 2,800 visits to the listing, and 6 active bidders participating in the auction (via Internet/Mail/Phone). Heritage also stated the $125,000 auction price is a world record for a non-autographed, still sealed Gem Mint 10 sealed copy. For more information and close-up photos of the album see; Heritage Auctions lot #89154. Want to quote us? If you're willing to credit the article to WhatSellsBest.com, and install a live-link to the original article, or www.WhatSellsBest.com, you can feel free to quote up to 50 words.